Holly Cottage is a beautifully renovated, Grade II listed, thatched cottage with period features, delightful gardens and countryside views. The quintessential cottage located in Dunstone, a picturesque and peaceful hamlet between Yealmpton and Holbeton offers a generous sitting room with multi-fuel burner, a bright breakfast room/kitchen, dining room/conservatory, bathroom and 2 bedrooms. Planning permission was granted in the past to extend both the ground floor and the first floor to create a wonderful 3 bedroom family home. Whilst the work to the ground floor was carried out soon after the permission was granted a buyer should satisfy themselves that the rest of the work can be implemented should they wish to, by talking to South Hams District Council planners. 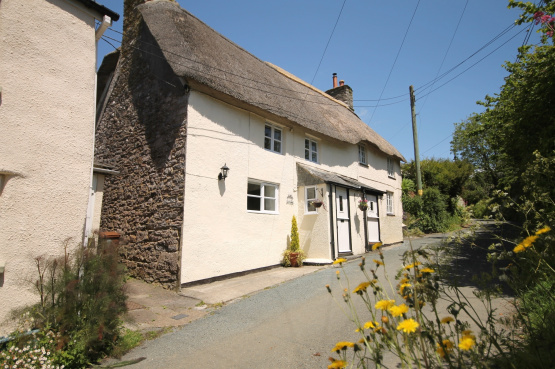 As this delightful cottage is close to Mothecombe beach, Holbeton and the yachting havens of Newton Ferrers and Noss Mayo the property would make an ideal holiday let investment or second home. Or it could provide a project for someone to create a delightful family home. Holly Cottage is offered for sale at £239,950. For further information please contact Marchand Petit’s Modbury office on 01548 831163.